By some estimates India’s pollution accounts for 1.3 million deaths each year. What should the country’s policymakers do about it? India needs to place the welfare of society above the quick gains of unfettered industrial expansion, write Asit K Biswas and Kris Hartley. The perils of rapid industrialisation in developing countries are well documented. Traffic congestion, agricultural land conversion, and unsafe working conditions are hotly debated topics. As a by-product of unregulated industrial activity, pollution is perhaps the most visible and publicised issue. It may also be the deadliest. Pollution is not a new problem in India, but its recent intensity is a clarion call for policy action. India’s leaders can no longer afford to look away. In the global media, China’s pollution is the cautionary tale of choice, illustrated by photos of Dickensian cities choked with smoke. Earlier this year, a shocking study revealed that over 4,000 Chinese people die each day from health complications related to air pollution. Even by conservative estimates (half that rate), three-quarters of a million people die each year from pollution in China—roughly equal to the population of San Francisco or Amsterdam. India faces a crisis of equal proportion. In June 2015, the World Health Organization (WHO) declared Delhi’s air quality the worst in the world. By some estimates, India’s pollution accounts for 1.3 million deaths per year—nearly one third of the global total. Cases of respiratory disease have spiked 30 per cent since 2010, and Delhi may soon lead the world in premature deaths from air pollution. Poor air quality has also been linked with rapidly declining crop yields. In 2013, the impact of pollution on India’s economy was an estimated US$80billion, 5.7 per cent of GDP. That number has likely risen since then. Pollution is a problem that spans policy arenas. In addition to industrial activity, evolving consumer preferences are a contributing factor. In Delhi, vehicle sales are robust and 1,400 new vehicles crowd the streets each day, adding to a current estimate of nearly 9 million in total. Not even night time offers a chance for the air to clear. Delhi residents awake to a fog of exhaust produced by 80,000 trucks flooding the streets between midnight and dawn for local and regional deliveries; these trucks are often unchecked by police or drivers for emissions controls and load limits. The benefits of cleaner fuel types, according to one analyst, are almost completely neutralised by the sheer number of vehicles on Delhi’s congested streets. People who live near major thoroughfares (often the poor) are at heightened health risk. Pollution sources go beyond industry and congestion. For example, agricultural burning has reached crisis levels in parts of Southeast Asia. “Haze,” or smoke (perhaps it should be called what it is), originates in Sumatra during crop clearing season and quickly shrouds neighbours like Singapore. This transboundary problem is testing political patience in the region, with Indonesia offering more apologies than results. There is no reason to believe that the burning will ever stop. Fighting air pollution, as with any vexing policy challenge, takes unwavering political will and committed implementation. There are signs that the Indian government is willing to address the issue. For example, in 1998 India’s Supreme Court forced the city of Delhi to exclusively use LPG for three-wheelers, buses, and other automobiles. The initiative improved Delhi’s air quality, but this marked the end of the progress. Since then, Delhi’s administration has developed few meaningful policies to address air pollution. There is ample evidence to support government intervention. A recent “car-free” day, during which air pollution dropped by 60 per cent, grabbed headlines and illustrated the impact of vehicle emissions. The recent launch of an air quality index should, at the very least, provide better understanding about conditions and trends for citizens and policymakers alike. The United States Embassy in Delhi already publishes air pollution data, and this may ultimately be an impetus for more transparency (as it has been in China). Despite worsening pollution and indisputable evidence about its causes, manufacturers continue to push back against regulations. The Modi government must decide whose interests to serve, wealthy industrialists or dying citizens. Based on the above evidence, the case for stricter controls is not difficult to make. 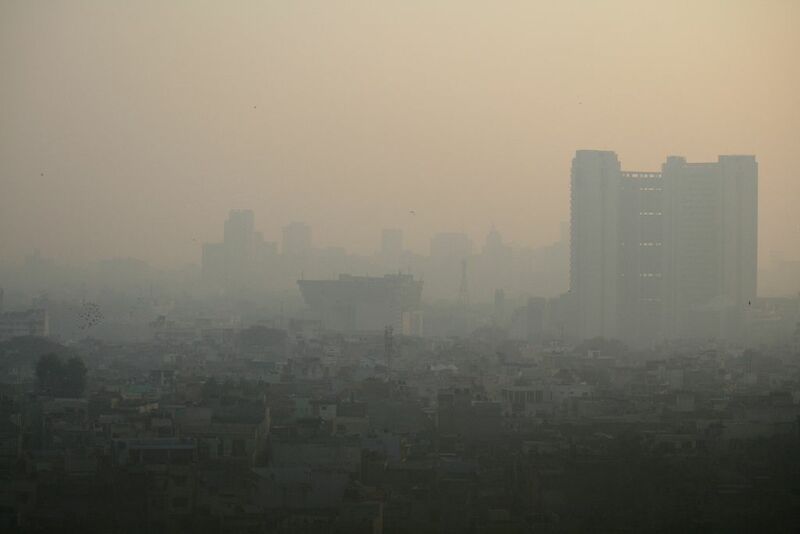 A recent Guardian article paints a vivid image of Delhi’s polluted environment: “Just beyond the city limits, thousands of primitive brick-making factories send plumes of black smoke into the air, while coal-burning power plants lack even the most basic filtration systems.” There are social, environmental, and economic arguments that support more aggressive pollution management. By-pass roads are not enough, least of all when they are planned but unbuilt. For Modi’s Make in India initiative to succeed, there must be an enabling and evidence-based policy environment that places the broader welfare of society above the expedient gains of unfettered industrial expansion. Growth provides jobs and improves livelihoods, but must be achieved in a way that does not visit irreparable damage to the environment and public health. Further, having the worst air pollution in the world is not the type of reputation that attracts Foreign Direct Investment. The Modi government now has an opportunity to exhibit leadership and set a global example. Asit K Biswas is the Distinguished Visiting Professor, Lee Kuan Yew School of Public Policy. National University of Singapore, Singapore. Kris Hartley is a Visiting Lecturer at Vietnam National University (HCMC), and a PhD Candidate at the Lee Kuan Yew School of Public Policy (NUS).